These stained glass images come from a village church in Zwingenberg, Germany. 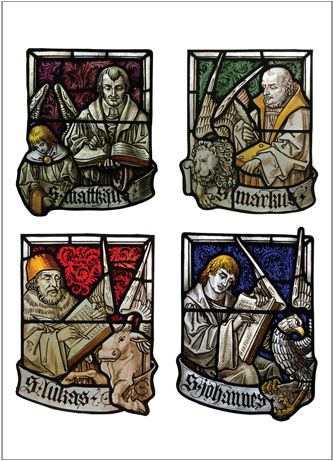 Christian tradition has historically associated the authors of the four Gospels with the four “living creatures” that surround God’s throne, as described in Revelation 4:7 – Matthew (S. Matthäus) with a man, Mark (S. Markus) with a lion, Luke (S. Lukas) with an ox, and John (S. Johannes) with an eagle. The four evangelists are traditionally represented in paintings, carvings, or stained glass near or on the pulpit to show that the Word preached by the pastor is a proclamation of Jesus’ own words as recorded in the Gospels. While this blank card is appropriate for any type of correspondence, it is especially suitable for ordinations, installations, or an anniversary of these, whether it be given to a pastor or used as an invitation to one of these occasions. As a reminder, please visit the Ordering Information tab for details about bulk orders, shipping, and international orders.